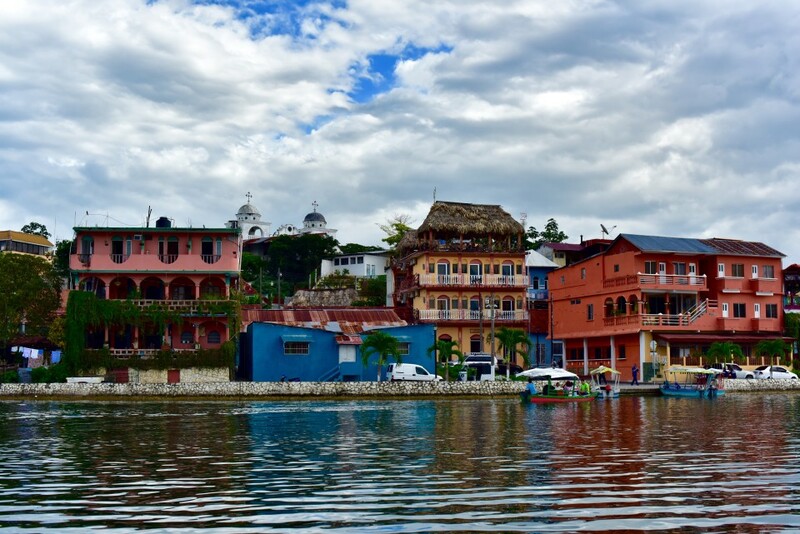 Flores, a quaint little island town in Peten Itza lake in Northern Guatemala is a very offbeat but certain to get popular with the tourists in the coming years. Flores is where Mayans made their stand in 1697 against the marauding Spaniards. Today the island is filled with the backpackers and good natured Guatemalans. 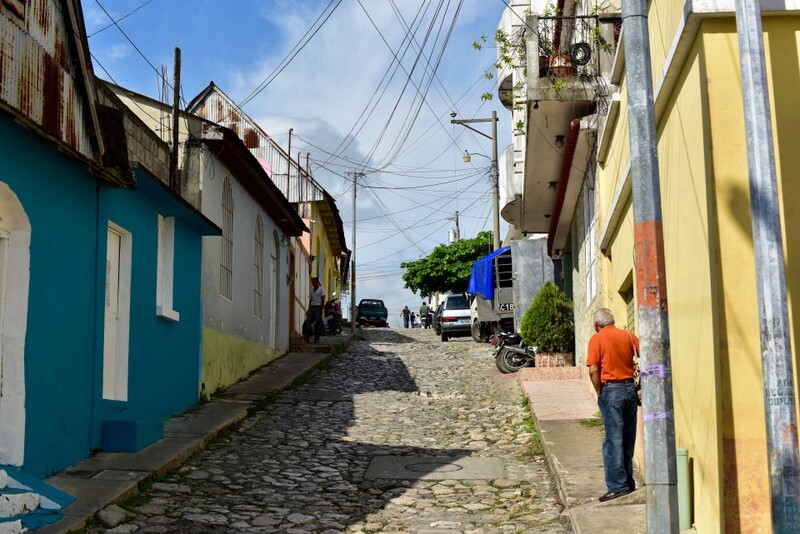 The streets resemble a typical Latin-American city with cobblestones and colorfully painted houses. What I couldn’t help notice is that the Indian Bajaj auto rickshaws (or Tuk-Tuks) rule the streets. The island itself is few kms wide and long. 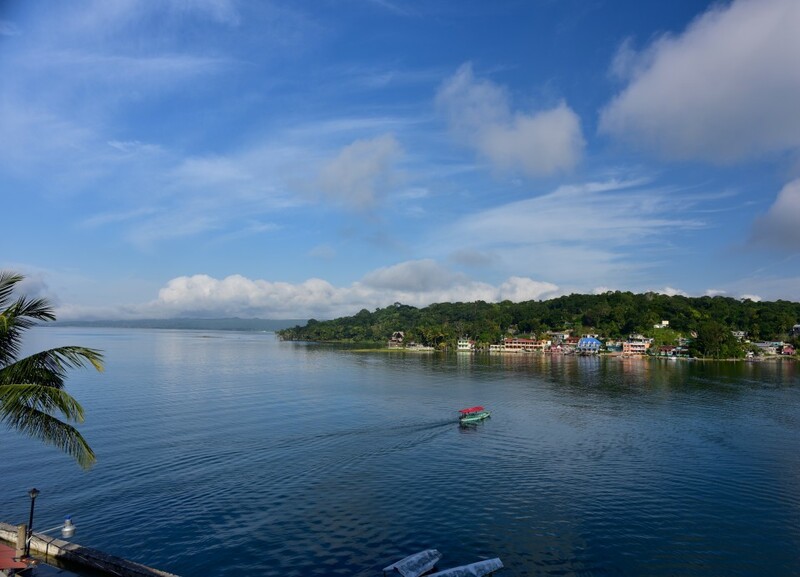 Note that Flores is made of Flores Island, Santa Elena and San Benito and is the capital of the Peten Department of Guatemala. But here if I talk about Flores, I mean the island which is connected to the Santa Elena through a narrow causeway. 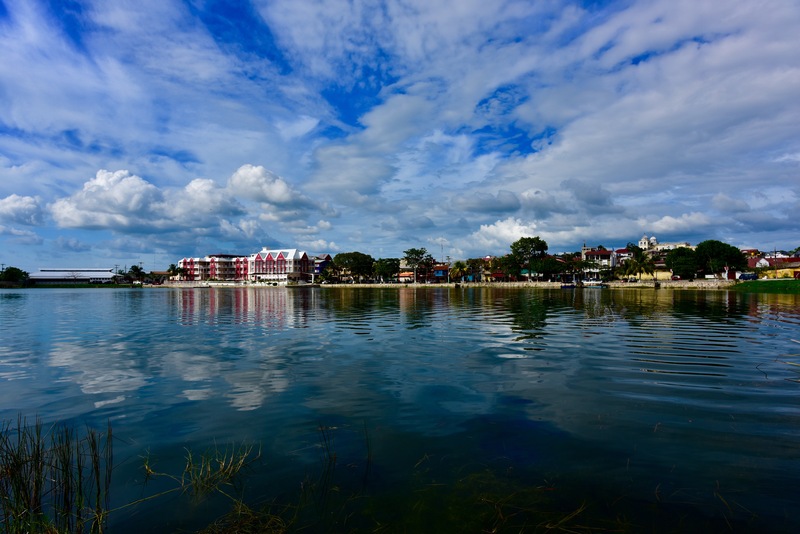 The lake, Peten Itza is the second largest lake in Guatemala and is about 20 miles long and 3 miles wide and is about 400 feet deep. Be advised that you would need at least few basic phrases of Spanish to survive here. Also if you are on a shoestring budget, Flores is the best place to go to as the hotels are not so expensive compared to San Pedro, Belize. And if you want to visit Tikal, Flores is your best bet to be the base camp as Tikal is an hour away making it easy for take Sunrise tour to Tikal. Hema and I traveled to Flores from Belize City in the last week of 2015 taking Fuente De Norte Bus from San Pedro Belize Express Water Taxi Terminal, a 5 hour journey which included a seamless border crossing of the Belize/Guatemala border at Melchor and reached Santa Elena from where we were picked up the local agents in their shuttle to the Flores island. But the shuttle journey dampened our spirits slightly as it took us another 2 hours to reach our hotel as we made a ATM stop in the supermarket at Santa Elena so that my fellow passengers can withdraw the Guatemalan Quetzales. Then we stopped by the travel agency office of the Fuente De Norte where they booked many of us for the local trips including the sunrise trip to Tikal before the shuttle dropped us off at the respective hotels. That is when we realized why the travel agent who was accompanying us to Flores island made the ATM stop. A very shrewd way to book the local trips before we can explore our options though Hema and I were completely fine with booking the sunrise tour through them as they had proved to be trust worthly in the trip from Belize city to Flores. We settled into our room at Hotel Sabana, which had gorgeous views of the Peten Itza lake which reminded me of the Dal Lake with its Shikara boats in Srinagar(not that I had visited Srinagar but the image was etched in my mind due to the numerous Bollywood/Kollywood movies) with the boats plying in the waters of Peten Itza and colorfully painted houses lining the lake in the inner and outer perimeter. This was definitely soothing to the eyes after our disappointment in San Pedro, which was overtly commercialized with tourism. Streets lined with these kinds of cobblestones. We were there for 3 days walking around the town, taking gorgeous landscape pictures of the island though I was slightly disappointed I could not do much portrait photography of the beautiful Guatemalans. There were numerous restaurants, most of them with a view of the Peten Itza lake, which was a unique experience by itself. We had not planned any activity except for the Sunrise tour to Tikal. But I enjoyed the local rides in the Bajaj autos, cherishing the nostalgic feelings of my life in Madras, India(borrowing the phrase from J.Peterman in Seinfeld, it will always be Madras for me). And I conversed with locals in my sparse Spanish though it did not extend beyond few words due to the mismatch in the fluency of the language. Hema and I sat and drank coffees or their local beer, Gallo, looking at the Peten Itza lake. Being the Christmas season, the town was decorated with colorful lights which added to the ambiance. In the evening, they had food stalls by the lake and sold soft drinks, meat dishes and desserts which included varieties of cakes. I rented the boat to go around the lake which set me back by $15 USD though it was very fulfilling.The kid who drove the boat was just around 14 years but was responsible enough to slow down the boat whenever he saw Hema or me taking pictures. There were not many tourists and most of them were backpackers. Whoever the tourist I saw on the island were the ones who had traveled with us from Belize city or taken a sunrise tour to Tikal. Probably there were only handful of tourists so that most of the tourists were familiar to me. There is not much nightlife though the island itself is very safe to walk around late night with the locals, especially the old, sitting outside and relaxing. The people are very laid back and very friendly. We had wanted to spend our New Year eve in Flores but we found out that there were no buses plying on New Year day and we had to move our trip ahead by a day. Needless to say, I felt a lump having to leave the little island with its beautiful,simple, good natured people and had rescued our trip from the disappointment of San Pedro. Bajaj autorichshaws or tuk-tuks rule the island. If you are flying from USA/Canada or Europe, I suggest flying into Belize City International airport as Flores is about 5 hours from Belize City compared to 10 hours from Guatemala city. From there head to the San Pedro Belize Express water taxi terminal taking a taxi which would set you back by 25 USD. At the terminal you can get bus tickets for Express Luxury buses, Fuente De Norte (FDN) and Linea Dorada bus lines from the Mundo Maya bus travel agency. There is also San Juan buses available and you can check with the same travel agency.The travel agency is located just 2 shops after the Water Taxi terminus baggage claim area. But do not book your return bus from this location as I saw they book a local mini bus, Marlin Espadas and they fill it up completely including the optional center seats. And you need to get your checked in luggages off the bus in the Belize/Guatemala border and recheck-in again which was not the case with FDN bus where you can leave your checked-in luggages in the bus while crossing the border at Melchor. Also the travel agents provide clear instructions which was helpful throughout the trip especially during the crossing of the border. Carlos from Mundo Maya bus travels was of very good help to us including waiting for us with a sign at the water Taxi terminus after we emailed him our itinerary. 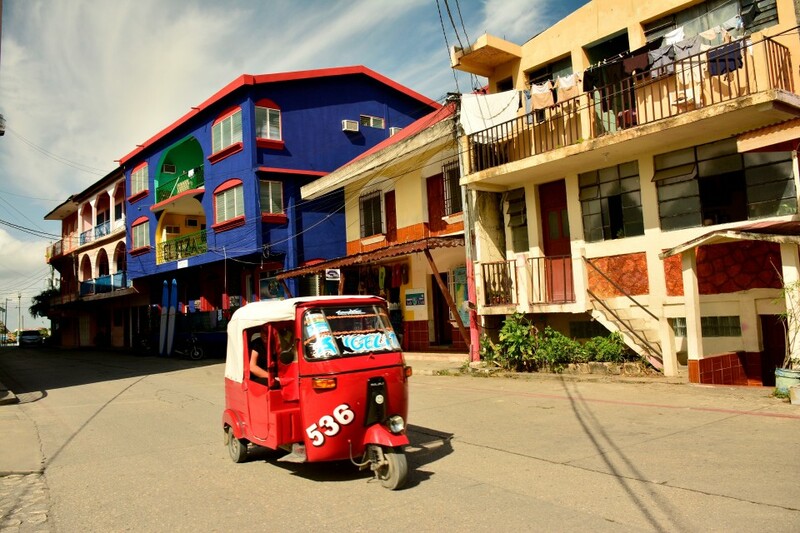 Once you reach Santa Elena, the travel agents will drop you at your hotel in Flores in a local shuttle. From Guatemala city, your best bet again is the FDN or Linea Dorada buses. If flying is an option, there is a Mundo Maya International airport in Santa Elena served by airlines like Tropic air. Island gets vibrant with the setting up of the foodstalls by the lake in the evening. What can you do in Flores? 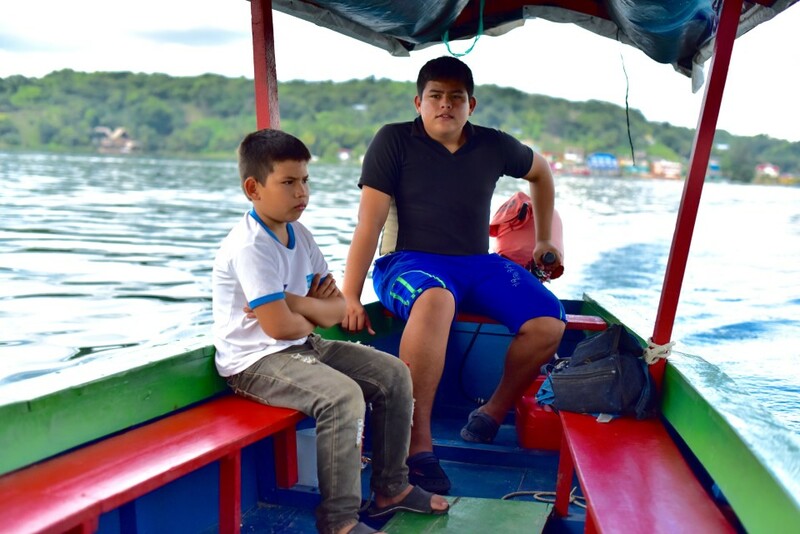 Rent one of the boats and travel around the Peten Itza lake. It would set you back by $15 USD but well worth it to see the colorful houses from a distance. 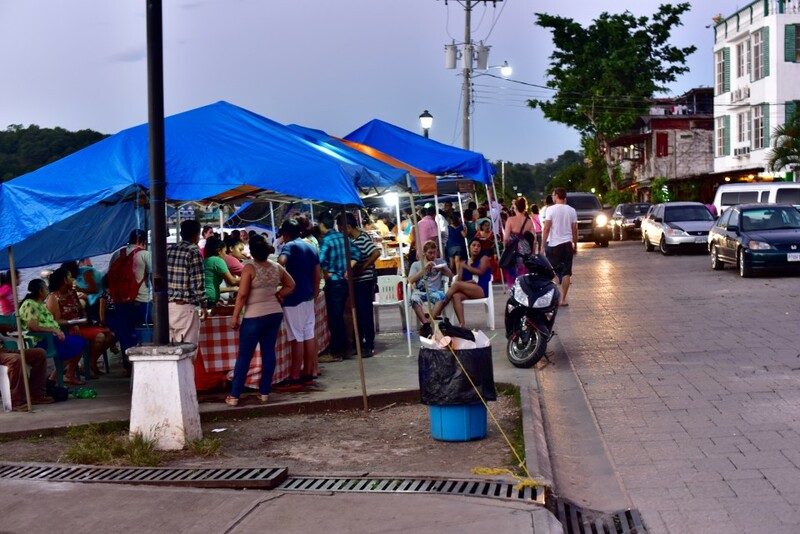 Walk up to Parque central and watch kids play basketball in the evening with a view of island. This is the base camp for the trip to Tikal as Tikal is about 60 kms away from Flores. Mundo Maya bus travels in the island can book you for the Tikal trip. Eat in the street food stalls by the lake and try out their street foods including the delicious desserts. We stayed in Hotel Sabana, a small boutique hotel, whose rooms carried old Air-conditioners,little noisy but in no way caused us discomfort. The staff, especially Julia, more than made it up with their helpful nature and exuberance. The hotel cost us $45 per night but there are hotels which are inexpensive than that. The hotel carried safety locker and the hotel staff held our large items like Laptops and Telephoto lens in their office. 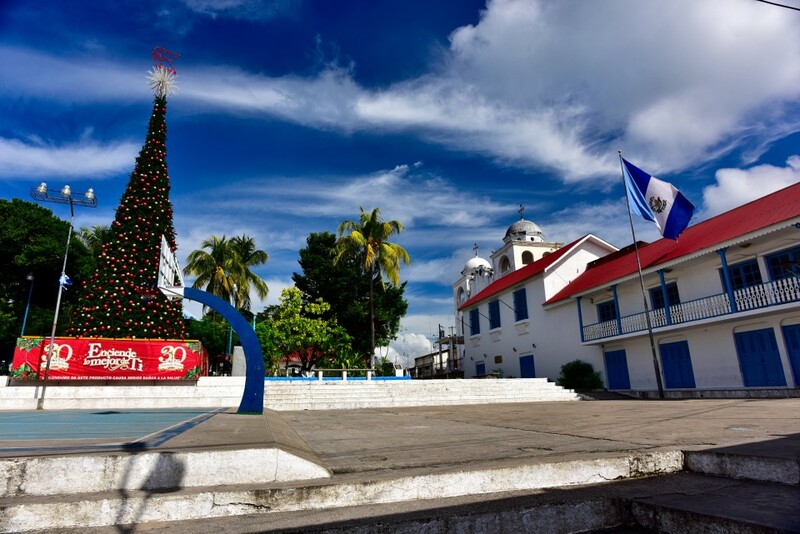 Book the tickets for Belize City of Guatemala City through the Mundo Maya travel agents located in the island as they are the authorized agents for FDN Express bus. But take care to check with them whether they are booking for FDN express. FDN bus or any other local bus you book through them will take you to the San Pedro Belize Express Water Taxi terminal where you can get a connecting water taxi to Caye Caulker or other islands and the baggage transfer is seamless and safe. We had an experience in a restaurant where the owner charged us 4 USD more in the final bill (I will leave it to your judgement whether it is a honest mistake on his part or otherwise). And he gave us a very bad exchange rate (1 USD to 7 Quetzales). Even a teenage kid in his shop offered us 1 USD to 7.5 Quetzales. So be watchful of these kinds of incidents. Carry some Spanish phrases book as it will come in handy as most people over there speak only Spanish. Peaty Scotch – Is it Overrated? Very informative post! I’ve been to Antigua twice, but would love to explore other parts of Guatemala one day. Flying into Belize is a great tip. Spend a few days there before heading into Guatemala. Your photos are beautiful! I do love the little guy with his arms crossed. Doesn’t look to happy. haha Thanks so much! I was supposed to spend a few hours in Flores but ended up spending the night as our flight out was cancelled. I was actually very happy about the cancellation- I really liked Flores. True. Flores has got something in it which makes it special. Any restaurants in particular yo&18#2u7;re interested in patronizing while in San Francisco?I have very fond memories of Pasha before the ownership changed hands (and subsequently drove it into the ground). I will never understand why someone would buy a business that is successful and then dramatically alter a good working model, but it happens more often then I care to contemplate. Do let me know what places you find noteworthy. It’s a great city to do good work. Been to SFO several times. Do not have plans to visit it in the near future. / Pretty section of content. I just stumbled upon your blog and in accession capital to assert that I get actually enjoyed account your blog posts. Any way Iâ€™ll be subscribing to your feeds and even I achievement you access cossnnteitly fast. Hello! I know this is kind of off topic but I was wondering which blog platform are you using for this site? I’m getting fed up of WordPress because I’ve had problems with hackers and I’m looking at aleitnartves for another platform. I would be fantastic if you could point me in the direction of a good platform. This is again wordpress. Did not have much problems with hackers. this website is in fact good and the visitors are truly sharing pleasant thoughts. a formidable job and our whole neighborhood will most likely be thankful for you. Thankyou for the feedback. Glad you found it useful. this wonderful paragraph at around this place. Some genuinely fantastic weblog posts on this internet site , thankyou for contribution. I think other website proprietors should take this internet site as an example , very clean and fantastic user pleasant design and style . Copyright 2018 | Saran Shanmugam Powered by WordPress and Donovan.